Drawing from imagination – embedded knowledge. A while ago a friend commented that my bike drawings looked like they had been done by someone who knew about bikes and that this was a good thing, it lent the images a believability which in some way rescued them from being merely the fantastical noodlings of a deranged mind. This got me thinking. What was it that enabled this believability given that all of the images are created without using specific photographic references or direct observation from life? I have a very good book by Ron Tiner called “Figure drawing without a model”, get it here, which covers the subject of creative drawing from the imagination and, whilst reading the introduction my attention was drawn (excuse the pun) to a particular passage in which he references this point. In a nutshell he poses the argument that every one of us has a degree of embedded knowledge about the world around us and that the essence of drawing from the imagination is about developing various tools which allow us to access this knowledge and use it in image making. Although the book deals specifically with drawing the human figure there are many parallels to be found in rendering other subjects. What I find interesting about all this is this notion of embedded knowledge, how we acquire it, access it and use it in creative expression through drawing. It’s probably worth considering this idea of embedded knowledge a bit more, what is it exactly? Our memories and imaginations are a huge combined resource that we carry with us at all times. Our minds are filled with stored references to the world around us, some are stored as images, others as direct tactile experiences. Some as emotional responses and others as smells and sounds. Our minds catalogue them and store them away for us to refer to later on through any number of triggers. If we consider the human form as an example, it is something we are all deeply familiar with and very knowledgable about. We have absorbed this knowledge since birth but, if we’re asked to draw a man running for example, we find it hard, we are unable to bring to the fore the precise information required to visualise this action in a believable way. This is because our mind has stored the act of running as exactly that, an action, not a picture of running. This makes drawing a running man difficult although we inherently “know” all there is to know about running already. This is, in it’s simplest form, embedded knowledge, and our challenge as we seek creative expression is teaching our minds to access it, our imaginations to use it, and finding ways to generate more of it. The book goes on to explore lots of creative tools and practices which will aid the reader in the development of imaginative drawing techniques, but my own thoughts stayed very much with this first chapter. I wanted to consider further this idea and how it influences my own output. Following the premise that Ron Tiner makes, that through observing and practicing the drawing of the human figure we learn it’s many characteristics, I arrived at the notion that this activity ultimately creates familiarity. We learn so much about, and become so familiar with the human figure that we can, in the end, visualise it in any situation we chose. It is this familiarity that struck a chord. If this is the case then there surely must be other ways to attain it as often we don’t have the luxury of endless visual practice? So, here’s my theory about how we gain this familiarity. It seems to me that it comes from three main activities: learning, absorption and creation. In learning we do what Ron suggests in his book, that we accrue knowledge through repeated action. By observing and drawing we learn the way things are and create the foundations for how things could be. The absorption part breeds familiarity through purely being around something for a long time and physically interacting with it. For example, I have never really sat down and drawn a bike engine in any detail from observation, not even from a photograph. But having spent a good deal of my time around them, fixing them, cleaning them etc I have gained a familiarity which allows me to draw them with a degree of confidence if not precise detail. Finally there is the creation element, and I hope this makes sense as I arrived at it from considering my time spent as a product designer. In this instance creating new design ideas or concepts requires the use of both imagination and pre-embedded knowledge from the outset. One informs the other to create new, never seen before, ideas. The process of developing a design fully often requires the visualisation and re-visualisation of every aspect of the object, its every facet and detail, even though it has never existed in reality. This generates in the mind of the designer a familiarity with the object which is both intimate and detailed and subsequently, enables them to visualise it without reference. Although these three directions may appear distinct, there is always some overlap to be found. In fact, it wouldn’t surprise me if everyone uses a combination of at least two most of the time.They all lead to the same point. The final interesting thing about this familiarity, born of all of these activities, is that it itself becomes embedded knowledge and is there for us to access in future. So one could propose that by learning to access embedded knowledge, it leads us to being able to create more of it. Perhaps this is one of the reasons why our drawings get better as we do more of them? A final thought for today is this. When someone says, “you have such a vivid imagination”, are they actually referring to your ability to dream up stuff, or the fact that you are purely able to access your embedded knowledge? 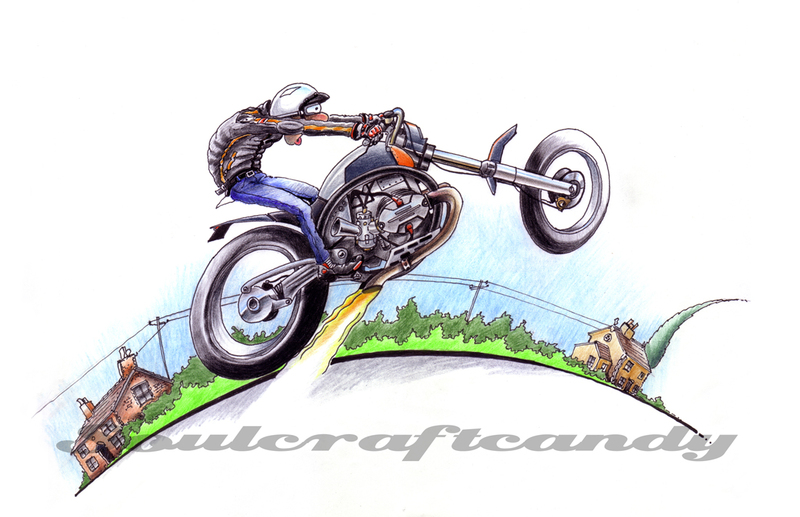 This entry was posted in Bike drawing, Creativity, Drawing, Embedded knowledge, Good books, Inspirations, Motorcycle drawings and tagged biro drawing, Imagination, Motorcycle drawing by Soulcraftcandyman. Bookmark the permalink. sitting in Combe Hay admiring this fantastic new work.